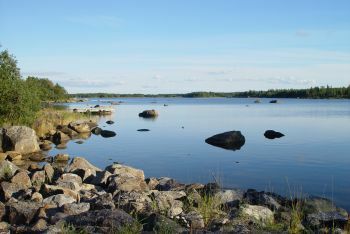 The Söderudden archipelago can be reached by car, boat or bicycle. Here you will find a great archipelago environment, a rich bird life and, according to statistics, one of the sunniest places in our country. Those who come on land to the Söderudden archipelago in order to experience the sunshine and the sea, will notice that a well-built asphalt road leads out to the first houses on the islands Karlsö and Kåtö. Three kilometres later you will reach Brändövik, and you will see the former school building that was later used as the Ohls fishing net factory. Here the road splits into two and a gravelled road goes to Vistan, which is located by the bay known as Revöfjärden. Here you can have a refreshing swim by the beach. If you continue along the asphalt road you will soon reach Söderudden. There you will find the primary school, which some claim to be the most beautiful school building in Swedish Ostrobothnia. If you continue along the road you will soon reach Klobbskat and Panike. In Panike you will find one of the end stations to the well-known hiking trail between Panike and Björköby. The hiking trail goes over the beautiful islands of Slottsskär and Rönnskär. The hiker will need a boat to travel over two sounds. More information can be obtained from Café Compass in Klobbskat. A shorter hiking trail, via the hill known as Kikanberget, is now being planned. 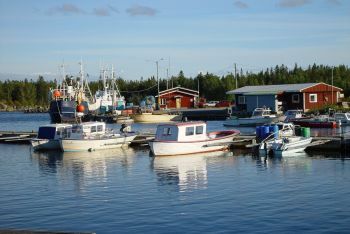 The harbour in Klobbskat is of great importance for the inhabitants here, despite the fact that it doesn’t employ many people. Klobbskat fishing harbour was built in 1972 and was then classed as one of the 14 central fishing harbours in Finland. This meant that the service level had to be higher than in a normal fishing harbour. In addition to local fishermen, also trawlers from the northernmost harbours in the Bothnian Bay visit the harbour. At most, the harbour has been used by approximately 40 trawlers. In combination with the fishing harbour, there is also a guest harbour for leisure time boats. Out on the promontory in Klobbskat, Kalles Inn is found with its famous Lapp tent, smoke sauna and a lighthouse with both a restaurant and a sauna. Boat trips, fishing trips and seal safaris are organised both by Café Compass and Kalles Inn.